Ruben's Landscape with Rainbow inspired many works, including Constable's Cottage at East Bergholt, painted 200 years later. David Howarth introduces a major new exhibition at the Royal Academy, the first anywhere devoted to the influence the artist has had from his lifetime to the present day. As the Royal Academy’s exhibition ‘Rubens and His Legacy’ so eloquently demonstrates, never in the whole history of painting have so many owed so much to one painter. Peter Paul Rubens (1577–1640) had massive self-belief, something Charles I discovered when he invited the artist to paint the Banqueting House ceiling at Whitehall. ‘Everyone according to his gifts; my talent is such that no undertaking, however vast in size or diversified in subject, has ever surpassed my courage,’ Rubens wrote. Yet Rubens’s responses to the Passion, well represented here, show him acquainted with grief. When Sir Edwin Landseer suffered a nervous breakdown, he found it helpful to make a chalk study of the head of Christ from Rubens’s Antwerp altarpiece Coup de Lance (about 1620); Landseer’s family were so proud of the resulting drawing, Christ on the Cross After Rubens (1840), that they presented it to Queen Victoria. Flirting is afoot in The Garden of Love (about 1633), an exultation of courtship and marriage. Rubens is best understood in Antwerp, which has preserved its integrity despite sacking, the Third Reich and discovery of the city by tourists. After he returned there from Italy in 1608, he bought an Italian-style villa, to which he added a stone studio designed in imitation of the palaces of Genoa. The interior is something of a fake today, more Elstree than artist’s studio, but it manages to evoke the life and times of this most cinematic of painters. As Bernini elevates Rome, so Rubens glorifies Antwerp. His masterpiece was the Jesuit Church, resplendent expression of a revitalised Catholicism: all stone and Rome, it is one of the glories of northern Baroque. In this church alone, Rubens painted 39 ceiling canvases in 1620, all now destroyed. This was the culmination of a decade of productivity unparalleled in western painting, during which he produced 60 altarpieces. Among them was The Elevation of the Cross (1610), now in Antwerp Cathedral, which is enormous at about 15ft tall. Rubens fascinated Sir Joshua Reynolds, who made two sepa-rate pilgrimages to Antwerp to study him. Sir Thomas Lawrence, who started life as a baby under the counter of his father’s The Black Bear pub in Devizes and ended it beneath the chandeliers of Windsor Castle, owed part of his ver-tiginous rise to his scrutiny of Rubens’s technique, the result of which can be seen in Princess Mary, Duchess of Gloucester of 1824. 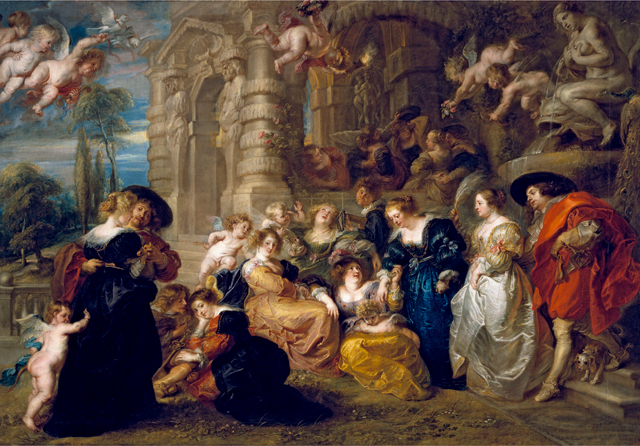 Lawrence also took care to find out how Rubens had moved in Society and partly modelled his own conduct on that of the Old Master and his most gifted pupil, Van Dyck. All three share the distinction of having been knighted by a British sovereign. It wasn’t just Rubens’s portraits that resonated. Late in life, when he retired to his country estate outside Malines, he bec-ame a visionary painter of land-scape. It was an achievement that Constable came to revere, as can be seen by the comparison made in the exhibition between Landscape with Rainbow of the mid 1630s and a furiously executed Constable painting, Cottage at East Bergholt, of about 1833. But it was in France, with his Marie de Médicis paintings of 1625, that Rubens exerted his greatest influence. That cycle, painted for the Luxembourg Palace, became the catechism for French art students. Just how deeply he was understood there can be appreciated by looking at a superb study by Fragonard after Rubens’s Nessus and Deianeira. Fragonard started with the finished picture, but copied it so confidently that it looks not like the original painting that was his model, but instead more like a Rubens oil sketch, of which there are many on show. (A surprising number survive and they have always been treasured by painters). So knowing is Fragonard that his zestful tribute was catalogued as being by Rubens as late as 1933. 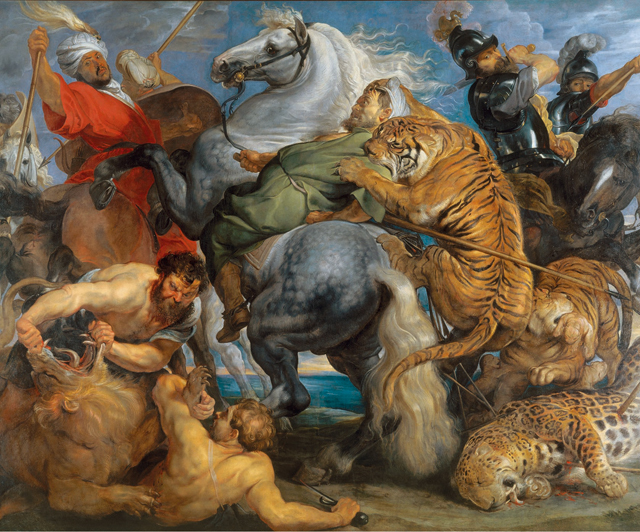 Rubens borrowed detailed from his other painting to create Tiger, Lion and Leopard Hunt (about 1617). Rubens ran an advertising agency via his reproductive prints. One, after Coup de Lance, is displayed with a Qing Dynasty dish of the same design; it can only have been known by its Chinese potter through the magnificent engraving by Boetius Adamsz Bolswert of 1631, which probably came into China with a Jesuit missionary. The dish was eventually shipped home and sold in London in 2011. It has now found a permanent home in that magnificent repository of Rubens paintings, the Royal Museum of Fine Arts Antwerp, barely a mile and a half from the studio in which the prototype was painted. The main theme of this exhibition is that this ‘Master of the Recycled’ was, and still is, endlessly influential. Despite the surprising omission of Frank Auerbach’s 1990s engagement with Rubens’s Samson and Delilah (about 1609), it’s an argument that the curators have convincingly made. Catherine Milner explores art inspired by the Spanish Civil War. Averil King enjoys an intriguing body of works from the Spanish Golden Age on show in Co Durham.